Delhi’s property market continued its snail-paced trajectory from Jan-Mar 2015 to Apr-Jun 2015 with insignificant growth in property prices. While frequent legal conflicts resulted in subdued buyer sentiment, a demand-supply mismatch gave developers a run for their money. The real estate story of India’s national capital continues treading its paradoxical path. Prices soar despite a huge inventory pile-up of 1.70 lakh units, recorded till Apr- Jun 2015 by ASSOCHAM. 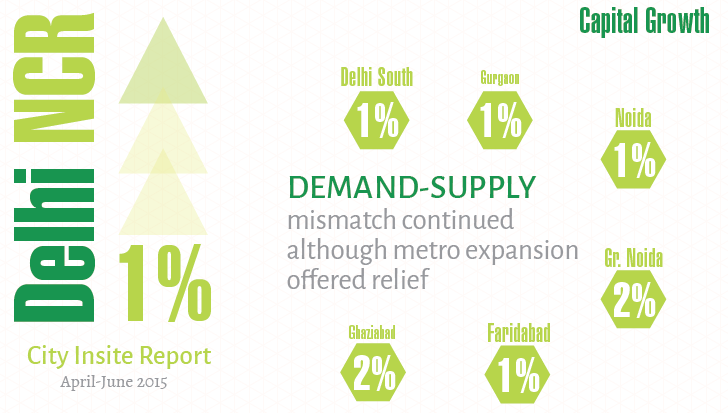 The expansion of Delhi metro improved sentiments in certain pockets of the market. However, it impacted the rental values more than the capital prices. Commencement of the metro construction towards Greater Noida lifted mood in the capital market from complete stagnancy in Jan-Mar 2015 to two per cent growth in the Apr-Jun 2015. Talks of a new International Airport in Jewar, Greater Noida, infused some hope and cheer to the property market, but it’s yet to translate into capital gains. Increase in office space absorption by IT/ITeS and e-commerce firms kept the commercial and home rental markets of Noida and Gurgaon upbeat. Ghaziabad’s realty, too, rose on the promise of numerous physical and civic infrastructure development projects, including roadways, overbridges and the metro. Gurgaon’s competition for the status of a ‘smart city’ has raised eyebrows as the city continues to face traffic gluts and remain starved of requisite infrastructure. 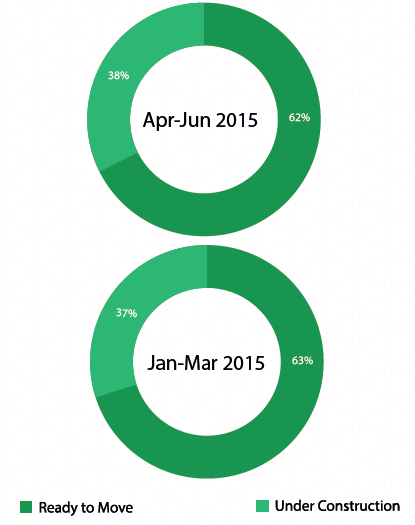 The drop in the number of new launches continue from the previous quarter to Apr-Jun 2015. Due to this trend, most properties in all budget brackets, save one, are in the ready-to-move-in category. Delhi witnessed a dip of over three per cent in Apr-June 2015, as compared to the preceding quarter. 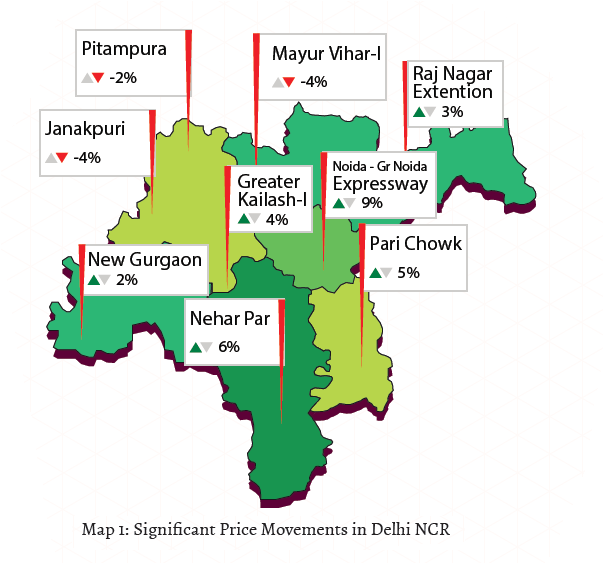 Property prices in South Delhi grew insignificantly, while that in North and West Delhi dipped by five per cent and eight per cent, respectively. Meanwhile, Dwarka’s price graph declined by four per cent. 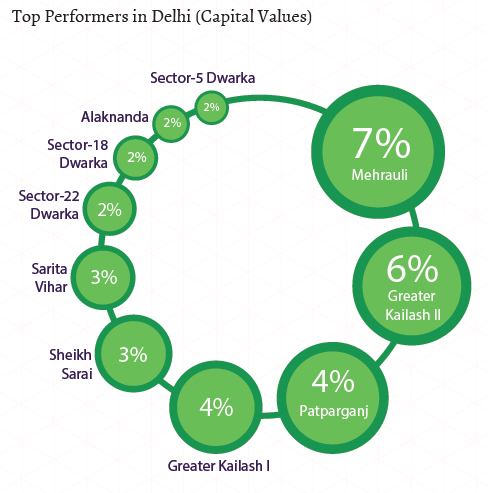 Mehrauli was the top grosser, witnessing seven per cent rise in capital values in Apr-Jun 2015, as against the quarter ending March 2015. The upmarket neighbourhoods of Greater Kailash I and II clocked a surge of six per cent and four per cent, respectively, in the quarter ending June. The area will get improved metro connectivity after the completion of GK Enclave-I metro station, which is less than 3 km from both GK I and II. After seeing subdued sentiments in Jan-Mar 2015, property prices in Patparganj rose to the tune of four per cent in the quarter ending June 2015. However, the metro corridor which was to connect Mayur Vihar-I to Anand Vihar ISBT, passing via Patparganj, has met with a land hurdle with the National Highway Authority of India (NHAI). The NHAI has asked the Delhi Metro Rail Corporation (DMRC) to return the plot for the purpose of widening NH-24 into 14 lanes. As opposed to the weak end-user and investor sentiments, the rental market of Delhi soared in response to the existing and developing infrastructure and increasing employment opportunities. Rental values in the region surged by an average of five per cent annually. East Delhi witnessed the highest uptrend in the zone by 10 per cent between Apr-Jun 2014 and 2015, followed by Dwarka with a spike of six per cent in rental amount. South and West Delhi clocked an increase of five and four per cent, respectively. A Y-o-Y analysis revealed that Jasola in South Delhi recorded over 20 per cent rise in rental values, the highest in the region. This locality has the advantage of a metro station just a km away from it. Following Jasola closely were Dwarka Sectors 18 and 19, and Patparganj, each clocking a growth of 18 per cent. Rental sentiments around Dwarka sectors have risen in the wake of the Punjab and Haryana High Courts removing the stay order on construction of the 18 km Northern Peripheral Road (NPR). Further, the DDA announced an ambitious transit- oriented development (TOD) project along the metro corridor in June. The DDA plans to develop a central hub spanning 28 hectares, featuring business and eco-recreational centres. The plethora of proposed social and physical infrastructure propelled real estate sentiments in Greater Noida from stagnancy in the last quarter to two per cent growth in Apr-Jun 2015. However, residential market in Noida maintained its slow growth pace with negligible price hike. The DMRC has mentioned a tentative timeline of three years for the metro corridor between the twin cities. The announcement of a new International Airport in the suburbs of Greater Noida – Jewar – is expected to lift market sentiments. However, the airport is currently embroiled in legal throes as the airport infrastructure of India does not permit for the construction of a second airport within a distance of 150 km. The Supreme Court’s ruling on Greater Noida land acquisition has cleared the haze of uncertainty for almost 1.5 lakh property buyers. CREDAI has assured the delivery of around 50,000 residential units by the end of 2015. In addition, the region saw commencement of a new bus service, called Yamuna Sarthi. This service will boost commutation facilities between the twin cities. The Noida-Greater Noida Expressway was the frontrunner with nine per cent spike in real estate prices, with Sector-16 in Greater Noida and Noida Extension following closely with six per cent each. Boasting of a massive 16 per cent spike in rental prices in the quarter ending June, Greater Noida realty landscape is riding the wave of Noida-Greater Noida Metro corridor, the construction work on which commenced in the month of June. The metro link is slated to be operational in 2018. In addition, Greater Noida Industrial Development Authority (GNIDA) has announced December 31, 2015 as a tentative date of the completion of the Dadri rail overbridge project. Once operational, the bridge will offer immense relief to the residents, who currently face heavy traffic snarls as a result of containers from the depot. The bridge will also benefit commuters as they can reach NH-91 without entering Dadri. 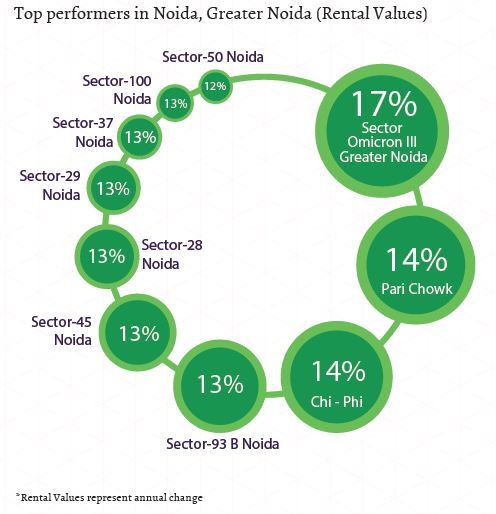 Rental values in Noida grew to the tune of four per cent between Apr-Jun 2014 and 2015. Improving connectivity, coupled with developing entertainment hubs are the prime growth drivers. According to a report published by CBRE, office leasing activity gained momentum by 70 per cent in Delhi-NCR, especially in Gurgaon and Noida during Apr-Jun 2015. Global IT giants, Oracle and NTT Data have leased out 1.25 lakh sq ft of space in Noida recently. Presence of IT majors creates more demand in the rental market as they attract workforce from all over the country. At times referred as the ‘Gateway of UP’, Ghaziabad’s realty landscape clocked an uptrend of two per cent in Apr- Jun 2015, in comparison to the preceding quarter on the promise of infrastructural growth. The city’s real estate sentiments thrived on the announcement of Rs 1,500 crore for infrastructure development. The major infra plans include expansion of metro network from Dilshad Garden to New Bus Stand metro and construction of a Northern Peripheral Road spanning 21 km between Tila Mod in Delhi to Dasna Toll Plaza on NH-24. Development of a six-lane Hindon Elevated Road is also on the cards. This road will follow the Hindon Canal route, starting from NH-24 till Karhera in Raj Nagar Extension, via UP Gate. These projects would ease the flow of traffic from other NCR regions. In the month of June, Ghaziabad Nagar Nigam (municipal corporation) extended its approval for minor civic infrastructure work worth Rs 15-20 lakh, such as touching-up of bitumen-topped streets, strengthening and streamlining of concrete-cement roads etc. GDA has prepared an ambitious report for development worth Rs 300 crore for constructing overbridges, pavements, service lanes and underpasses at varied locations. National Highway 91 emerged as the highest grosser with nine per cent spike in property prices since March 2015. An annual analysis revealed that rental values in Ghaziabad rose to the tune of 10 per cent in the quarter ending June, after a five per cent rise in Jan-Mar 2015. The city’s rental market thrives on its working population and affordability quotient, with convenient connectivity to Noida and Greater Noida being an added advantage. Vaishali saw the highest appreciation in the rental graph by 18 per cent from Apr-Jun 2014 to the same quarter this year. The proposal to expand the Vaishali metro link to Mohan Nagar has given a massive fillip to realty sentiments. The integrated project of Crossing Republik witnessed rental prices rising by 17 per cent during the same span. In addition to metro connectivity being on the cards, the locality is comparatively more affordable than neighbouring Vaishali and Indirapuram, where rental demand rose by eight per cent in the last one year. Raj Nagar Extension, saw rental values climbing by 14 per cent Y-o-Y. The promise of improved road infrastructure seems to have increased housing demand in the locality. As expansion of Delhi metro improves connectivity between Ghaziabad and the rest of the NCR, rental values are expected to head further north. Gurgaon and Faridabad saw an uptrend in capital values, albeit an insignificant one per cent in Apr-Jun 2015. Homebuyers continue with their wait-and-watch approach, although both the cities are frontrunners in the race for the ‘smart city’ tag. In addition to boasting an array of luxury houses, the Millennium City of Gurgaon is witnessing the emergence of a new segment of properties, mid-range luxury housing. However, the luxury and mid-luxury segments do not have many takers, despite a substantial number of enquiries. The capital values of luxury properties had swelled by almost 17 per cent in 2011-12, on a year-on-year basis. This trend narrowed to 3.7 per cent in 2012-13 annually and dipped further to one per cent in 2013-14. Gurgaon has an upcoming underpass project at IFFCO Chowk, Rajeev Chowk and Singature Towers. Once this ambitious project gets completed, it will ease traffic snarls on the Delhi-Gurgaon Expressway. However, the project has hit a space hurdle at IFFCO Chowk recently. Construction of the metro network has given Faridabad a fresh lease of life. Despite being designed in accordance with the Nehruvian vision of a ‘City of Hope’, Faridabad has remained dependent on autos and buses till date. The metro will become the city’s first transit system. Rental demand remained robust in Gurgaon and Faridabad, with prices increasing by four per cent, each, in a year’s time. 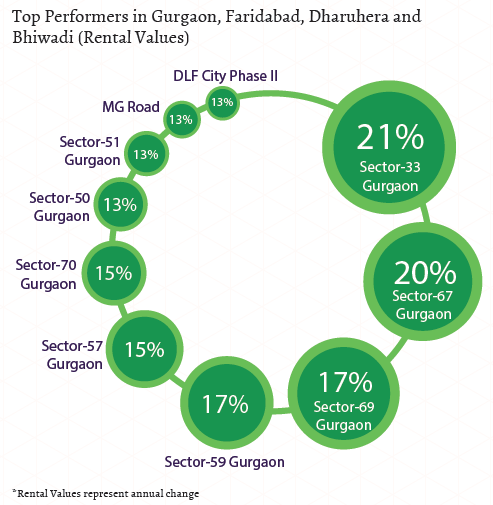 The highest grosser in Gurgaon was Sector 67 where values rose by 20 per cent in Apr-Jun 2015 as compared to the same quarter last year, followed by Sectors 69 and 59 where rentals increased by 17 per cent, each. A CBRE report stated that Gurgaon accounted for 73 per cent of the total office space transactions that took place in the NCR in Apr-Jun 2015. The rise in rental values can be attributed to the increase in housing demand from the workforce of these IT/ITeS and e-commerce companies which leased out space in the city. 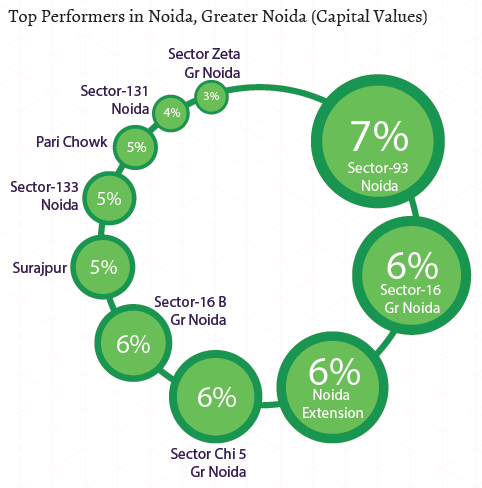 Sector 86 in Faridabad witnessed rental values escalating by 14 per cent during the same span. Housing demand in this industrial township is being fuelled by expansion of the DMRC line. While residential rental prices have improved considerably in certain parts of the city, commercial yields are expected to surge by 25-30 per cent in the forthcoming quarter. In addition to capital values, Alwar Bypass Road in Bhiwadi saw rental yields rising to the tune of 17 per cent. The rental market of the region is primarily propelled by the workforce in Gurgaon. As end users and investors continued to sit on the fence, the property supply graph proceeded its slow trajectory from Jan-Mar to Apr-Jun 2015. Decline in housing demand translated into a steep downslide in the number of new launches in Delhi NCR. 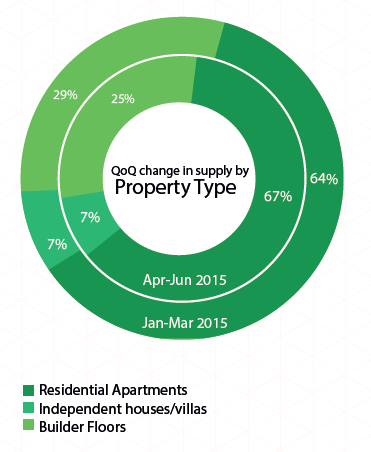 Supply of different property types – residential apartments, builder floors and independent houses/villas witnessed slight variation in Apr-June 2015, as compared to the previous quarter. Multi-storeyed apartments continued to be the most popular property type, capturing almost two-third of the total market share. High demand due to the unparalleled convenience offered by apartment-living resulted in increased supply of these units in this quarter. Maximum inventory of apartments was witnessed in Gurgaon and Noida. A quarter of the city’s total inventory was for builder floors, making it the second highest supplied property type in Delhi NCR. Delhi and Ghaziabad recorded the maximum supply for builder floors. Independent houses/villas made up a mere seven per cent of the entire market share. Delhi recorded the maximum share of independent houses/villas, followed by Gurgaon and Greater Noida. With the government focusing on budget housing, there was an increase in the supply of properties priced within Rs 40 lakh. Unlike the previous quarter, the said budget category hogged the limelight and captured almost a quarter of the entire market share of Delhi NCR. Ghaziabad, followed closely by Delhi and Greater Noida, had the maximum residential inventory in this category. Bhiwadi and Dharuhera too had majority of the inventory priced within Rs 40 lakh. High-income housing category (Rs 60 Lakh to Rs 1 crore) was the next most supplied in the city and captured almost another quarter of the total market. Gurgaon and Noida had the maximum properties available in this budget. 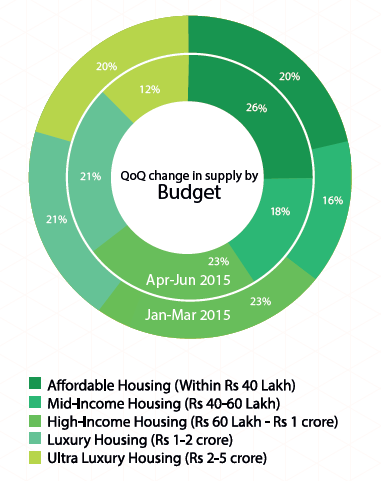 Supply of luxury-housing (properties priced between Rs 1-2 crore) remained unchanged since quarter ending March 2015. The category made almost 20 per cent of the total market. Close to half of the inventory of properties in this price bracket was in Gurgaon. Delhi and Noida too had a significant supply of these units. Supply of mid-income housing (properties priced between Rs 40-60 lakh) increased by two per cent from Jan-Mar 2015 to Apr-Jun 2015 and stood at 18 per cent. Noida and Ghaziabad offered maximum housing units in this budget category. Supply of ultra-luxury housing, priced between Rs 2-5 crore, dipped significantly and stood at 12 per cent in the quarter ending June 2015. Delhi and Gurgaon made up almost the entire market for these properties (85 per cent). Close to 10 per cent of these units were in Noida. 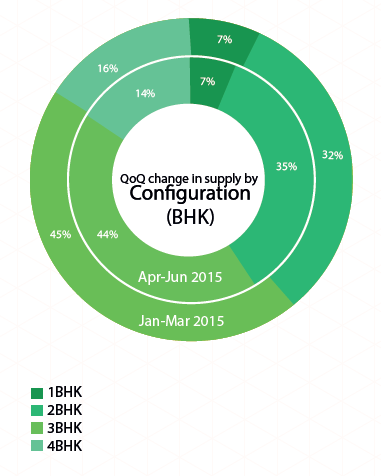 Continuing with last quarter’s trend, 3BHK units emerged as the most supplied ones in Apr-Jun 2015, capturing almost half of the entire market share. Taking the lead, Gurgaon offered maximum 3BHK units and contributed almost 30 per cent to the total supply in the city. Delhi and Noida followed by contributing close to 20 per cent each. More than two-third of the remaining half of Delhi’s residential inventory was taken up by 2BHK units. Catering to most of the housing demand from middle-income home buyers, Noida and Ghaziabad recorded maximum supply of these units. Most of the properties in Greater Noida, Bhiwadi and Dharuhera were configured as 2BHK units. Supply of 4BHK units dropped by two per cent in this quarter and stood at 14 per cent. Catering to robust housing demand in the luxury and ultra-luxury price brackets, Gurgaon recorded maximum supply of 4BHK units. Properties with 1BHK configuration seemed to be the least popular. Delhi and Ghaziabad recorded the maximum supply of these housing units. Within Delhi, West and South zones were the most popular for such single room homes. Similar to the previous quarter, more than 60 per cent of the properties in Delhi NCR were ready-to-move-in. Being a secondary market, Delhi continues to have maximum inventory of these units in NCR. In Delhi alone, 85 per cent of the properties were in the said category. Almost 70-80 per cent of the total inventory in Ghaziabad and Faridabad was ready-to-move-in. Slow absorption of housing units refrained builders from announcing new projects. Almost three-fourth of the inventory in Noida, Greater Noida, Bhiwadi and Dharuhera continued to be under-construction due to long delays in project deliveries. The National Green Tribunal’s (NGT) ban on construction of houses within a radius of 10 km round the Okhla Bird Sanctuary delayed many projects in Noida and Greater Noida.